Note : For 3 years old and above. This theatrical dance production is the brain child of Manjari Chaturvedi, it incorporates live music, live dance and storytelling narration. This re-lives a heritage of Mystical Traditions of Punjab as never seen before. 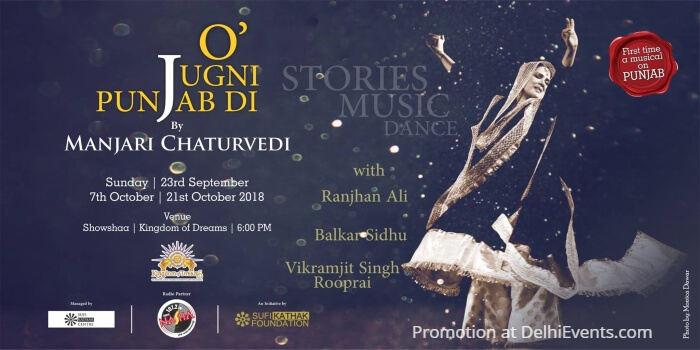 Mystical Dance on the poetry of Punjab, re-creating the dance of the mystics and the unique female character of the wide eyed JUGNI of Punjab. The character of Jugni is rooted in defiance and rebellion, a deeply transgressive woman that brings a fiery woman character back into the popular vocabulary. In a largely patriarchal society the figure of Jugni when invoked almost always, the Jugni signifies a free spirited feminine energy.